Interactive education programs for Canadian Insurance brokers and other professionals. Courses qualify for continuing education credit hours. Offers insurance continuing education (CE) courses for California. View all courses free. Internet, book, and CD-ROM courses available. Offers a broad range of property and casualty courses in personal and commercial lines. Courses are interactive and emphasize the relationship between insurance theory and insurance practice. Located in Maryland, United States, seminars offered in a broad regional area. Providers of New Jersey, USA, insurance continuing education courses, including both classroom and online courses. Provides professional skills training and continuing education courses. Site describes courses and schedules. Located in San Diego, California, United States. Providing continuing education and 40 hour insurance courses in Florida. Continuing education and pre-licensing courses for insurance and financial services professionals. Courses available for all 50 states of the USA. Classes offered include property and casualty, life and health, surplus lines qualification, and license exam preparation. Site includes description and schedule of courses, Florida requirements, and offers CD courses for all states. Offers instructor-led insurance training and education courses and workshops available in the classroom, online or as self study. Serves California, Oregon, Washington, Arizona, and Nevada, USA. Offers instructor-led insurance training and education courses and workshops available in the classroom, online or as self study. Serves California, Oregon, Washington, Arizona, and Nevada. Education training for classroom and online insurance CE and CEU courses. Specializing in training courses from fundamental project management courses through courses for more experienced project managers. White papers on several topics are available. Courses available for licensing and continuing education in California. Offers web-based, state-approved insurance continuing education courses for all states of the USA. Site contains information on leadership, legislation, and CE and LUTC courses. Continuing education (CE) self-study courses for insurance agents, brokers, and adjusters throughout the USA. compass courses provides uscg approved stcw training in seattle, or on your vessel. courses include stcw firefighting, personal survival, personal safety & social responsibilities, first aid & cpr, crowd management. On-Line continuing education courses for insurance professionals. Provides professional online and correspondence insurance continuing education courses in the United States. Represents over 20 different insurance companies which provide a full range of insurance products. Offers most lines of business and personal insurance, as well as special insurance for logging and lumber. Offices in Medford and Abbotsford. Offers training in all levels of first aid and CPR. Both public courses and client site-based courses are offered. An insurance 'niche' job board offering various insurance jobs listed by insurance companies, insurance agents/brokers and recruiter professionals. Find insurance candidate resumes and contact potential employees directly. Option courses taught by market makers and floor brokers from the Pacific Exchange (PCX). Fee reqired for courses. If the business hours of ILS Learning Corporation in may vary on holidays like Valentine’s Day, Washington’s Birthday, St. Patrick’s Day, Easter, Easter eve and Mother’s day. We display standard opening hours and price ranges in our profile site. We recommend to check out ilscorp.com/ for further information. 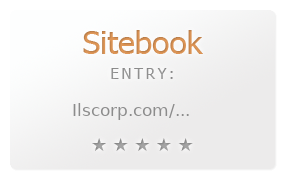 You can also search for Alternatives for ilscorp.com/ on our Review Site Sitebook.org All trademarks are the property of their respective owners. If we should delete this entry, please send us a short E-Mail.